The following tutorial will show you how to create a video distribution platform, ready to target multiple devices and browsers with a DRM system compatible with Apple’s FairPlay, Google’s Widevine, Microsoft’s PlayReady and the open-standards-based Marlin DRM. 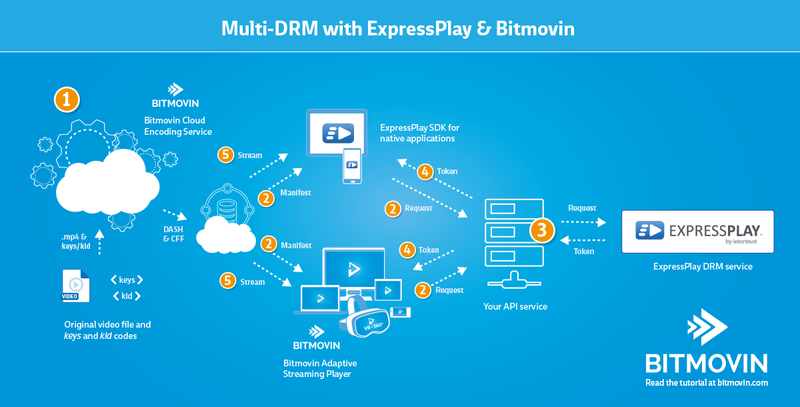 This solution is an end-to-end solution that integrates the ExpressPlay Multi-DRM system with the Bitmovin Cloud Encoding system. By following this tutorial and using the supporting documents that you will find linked below, you can create a video on demand service with the same speed and quality as Netflix. The following code example shows the configuration required to encrypt your adaptive stream to use Playready, Widevine and Fairplay. You are not required to include all the DRM schemas. For example, you can leave out Fairplay if it is not required. Please see this tutorial, which explains how to create a Fairplay DRM protected encoding. The following parameters are required in order to create a successful DRM protected encoding using the ExpressPlay Multi DRM service. Each tutorial provides a full example, which you can use in order to create your own DRM protected content using ExpressPlay MultiDRM Services.